My Top 3 Jackets Right Now! So this year, I’ve discovered a newfound love for jackets/coats! I’ve never really been too bothered about my outwear but this year there’s been quite a selection around to choose from! This first jacket, I own myself, and it’s honestly been the best purchase of the year! It set me back £95 in topshop but i’m so glad I chose to splash a little! Worth every penny I tell ya! I love the overall style of parka jackets and this one in particular is so comfortable and really kept me warm when I was back in the UK last month. The jacket actually has a detachable lining, which includes the insanely fluffy hood, so it’ll still be wearable into next year once the weather starts warming up a little. 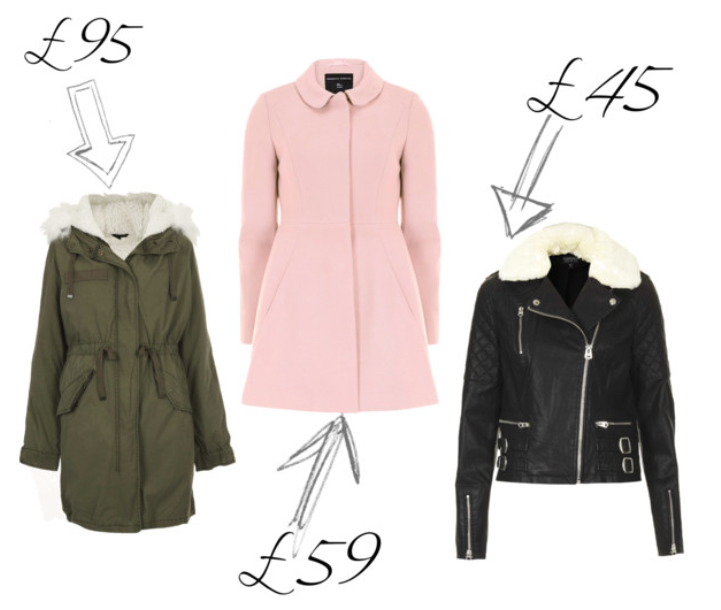 If you’re still looking at buying a new coat I would really recommend this one! It’s also available in petite and tall, let me know if you make a purchase! This second coat I actually spotted in Dorothy Perkins a few days ago and I fell in love! The inner girly girl in me is coming out this season and I love it! This jacket is super soft and makes me feel like a princess! I haven’t bought it, yet, but I’ve tried it on and I very nearly walked out the shop with it still on! It has such a flattering shape to it which I seem hard to find in coats that are practical. Standing at £59, you’ll be bagging yourself a bargain if you ask me! It’s safe to say if you’re in possession of this bad boy, i’m very jelly. Last but certainly not least is another topshop number that I spotted just yesterday that’s a) beautiful b) on sale and c) see a! I’ve never owned a leather jacket but I always seem to lust over them!﻿ I adore the furry collar(it’s detachable should you not love it like I do) and although I’ve not yet tried this one on, it looks super snug! I’ve seen so many people recently with a little leather jacket so I’ve decided that every girl needs one! At least, that’s what i’m telling myself whilst putting it in my basket..
Have you got a favourite jacket/coat right now? I’d love to see what everyone’s loving right now!